Reference number for this case: 16-oct-54-Thin. Thank you for including this reference number in any correspondence with me regarding this case. Flying saucers give skin diseases! Charleville (from our correspondent). -- A curious luminous form, which many people saw moving, Saturday, around 10 p.m. in the sky of Sedan was photographed. An amateur photographer, who took the fresh air at his window in the company of two comrades, suddenly saw in the sky a luminous disc which moved at a high speed. Grabbing his camera, he managed to take two impressive shots with exposure times Of one or two seconds. This lighting phenomenon has been seen by some fifty people, including police officers and several Sedanese personalities. Meteor or flying saucer, opinions are divided. On the other hand, it is pointed out that in Thin-le-Moutier, a village in the district of Mezière, a Woman would have seen a flying saucer land less than thirty meters away from her and frightened, she Would have immediately lost consciousness. Since then that person, who enjoys general esteem in the country, suffers from a strange skin disease and is obliged to stay in her bedroom. Jacques Vallée indicates that on October 16, 1954, in Thin-le-Moutier in the department of Isère, a "flying saucer" was reported to have landed 30 meters away from a woman who is said to have lost consciousness and to have then suffered from a skin disease. Jacques Vallée adds that he does not make any judgment yet on the value of the testimony neither on the sincerity of the witnesses nor on the plausibility of the reported facts. Oct. 16, 1954 Thin le Moutiers (France). Approximate date. The two authors indicate that the date for this case in Thin-le-Moutier in the Ardennes is not precisely known. They indicate that in the morning, a young woman, Jeanne Rossignon, went to get the cows in a pasture close to the village to bring them back to the farm for milking them. When she arrived at the top of a small hill, she found herself face to face with a machine posed on the ground at a very short distance. She fainted almost at the same time. When she recovered consciousness, the machine was not there anymore. She managed to return home, but she had to confine to bed. She suffered during several days from a strange dermatitis which disappeared only slowly: her skin resembled a toad's skin. "Such reactions are frequent following violent emotional shocks. The young woman thus did not invent this story." The authors indicate that on October 16, 1954 at an unspecified hour close to Thin-le-Moutier, Jeanne Rossignon went to get her cows in a pasture close to the village to back bring them to the farm to milk them. Arriving at the top of a small hillock she was confronted with a craft posed on the ground within 30 meters of her, and almost at the same time, she fainted. When she regained consciousness, the craft had disappeared. She returned home and had to stay in bed. A strange dermatitis started and she had a skin like that of a toad during several day. A professor of the Faculty of Medicine of Dijon alerted by ufologist Charles Garreau looked after her. The authors indicate that the sources are the Vallée catalogue, case 271, C. Garreau and R. Lavier in "Face aux E.T." pages 27,28, and "Challenge 53". On October 16, 1954, at an unspecified time, in Thin-le-Moutier in the Ardennes, Mrs. Jeanne Rossignon went to get her cows. She saw a machine landed on the ground thirty meters away, and it seems that she lost consciousness because of her fright. Jean Sider also quotes the indication of Michel Figuet: a strange dermatitis affected Mrs. Rossignon, during several days, her skin taking an aspect of a toad's skin. Another source indicates that the witness suffered of a strange disease since this day and had to remain inside the house. Eric Maillot indicates that according to Jean-Michel Ligeron, on October 16, 1954 at an unknown hour in Thin le Moutier in the Ardennes, an object posed on the ground was seen within 30 meters. He adds that the alleged effects were a fainting and a skin rash. He indicates that the case is anecdotic and is increased by a psychosomatic reaction on an impressionable witness and a media influence on the flying saucers and that no flying object is seen in this case. The Belgian ufologist indicates that in 1954, at the approximate date of October 16 in France in Thin-Le Moutiers, the Ardennes, "an object lands at approximately 30 m of a woman who faints. The witness suffered from a skin disease following this incident." The source is indicated as "Challenge 53 (Jacques Vallée: "Chronique des apparitions ET" - DENOEL 1972 - COLL. J'AI LU - p. 283)". She adds: "Jeanne Rossignon seeks the cows to milk them at the farm. While arriving at the top of a small coast she is in front of a machine posed on the ground at very short distance. Almost at the same time she faints. When she regains consciousness, the machine had disappeared. She succeeds in reaching home but must be confined to bed. A strange dermatitis started which only disappears very slowly: during several days the skin of the young woman resembles the skin of a toad." The source is indicated as "GARREAU et LAVIER: "Face aux extra-terrestres" - DELARGE 1975, J'ai Lu, p. 29, 30". 1954 – On or about this date a UFO landed in Thin le Moutiers, France only thirty meters away from a woman, who promptly fainted. Following the incident the witness suffered from a skin condition that she linked to the encounter. (Sources: Jacques Vallee, Challenge to Science: the UFO Enigma, p. 53; Jacques Vallee, Passport to Magonia: A Century of Landings, p. 231). In Thin-le-Moutiers (Isère) a woman sees a flying saucer land at 30 m and faints. She suffers from a skin disease thereafter. The source is indicated as "Vallée 1966, 53". Luc Chastan indicates that in the Ardennes in Thin le Moutier on October 16, 1954 at an unknown hour, "a woman seeks the cows to milk them at the farm. While arriving at the top of a small coast she is in front of a machine posed on the ground at very short distance. Almost at the same time she faints. When she regains consciousness, the machine had disappeared. She succeeds in reaching home but must be confined to bed. A strange dermatitis started which only disappears very slowly: during several days the skin of the young woman resembles the skin of a toad." The sources are indicated as "Face aux Extra terrestres by Garreau and Lavier ** DELARGE 1975," and "Chroniques des apparitions E.T. by Vallée Jacques ** DENOEL 1972 - coll. J'AI L". The website indicates that on 16 October 1954 at 21:30 in Thin le Moutiers, France, "An object landed about 30 meters away from a woman. Explanation: Meteor." And: "On or about this date a UFO landed in Thin le Moutiers, France only thirty meters away from a woman, who promptly fainted. Following the incident the witness suffered from a skin condition that she linked to the encounter." And: "An object landed about 30 meters away from a woman, who fainted. The witness suffered from a skin disease following the incident. Approximate date. A meteor-like object was observed. One object was observed by several witnesses." The sources are indicated as Michel, Aime, Flying Saucers and the Straight-Line Mystery, S. G. Phillips, New York, 1958; Vallee, Jacques, Computerized Catalog (N = 3073); Schoenherr, Luis, Computerized Catalog (N = 3173). The website indicates that on 16 October 1954 at 22:00 in Thin-le-Moutier, France "UFO lands 30m away from woman. She faints, develops skin disease." And: "Reported encounter with inhuman beings involving radiation effects. One object, about 1 foot across, around 100 feet away, was observed by one female witness, an experienced observor, in a forest for over six minutes." The sources are indicated as Sparks, Brad, Computer Catalog of Type 9 Cases (N=150); Bowen, Charles, The Humanoids: FSR Special Edition No. 1, FSR, London, 1966; Vallee, Jacques, Computerized Catalog (N = 3073); Vallee, Jacques, Challenge to Science: The UFO Enigma, Henry Regnery, Chicago, 1966; Vallee, Jacques, A Century of Landings (N = 923), (in JVallee04), Chicago, 1969; Schoenherr, Luis, Computerized Catalog (N = 3173); Hatch, Larry, *U* computer database, Author, Redwood City, 2002. *Oct. 16, 1954 – On or about this date a UFO landed in Thin le Moutiers, France only thirty meters away from a woman, who promptly fainted. Following the incident the witness suffered from a skin condition that she linked to the encounter. (Sources: Jacques Vallee, Challenge to Science: the UFO Enigma, p. 53; Jacques Vallee, Passport to Magonia: A Century of Landings, p. 231, case #271). [er1] Article in the regional newspaper L'Est Républicain, France, page 6, October 21, 1954. 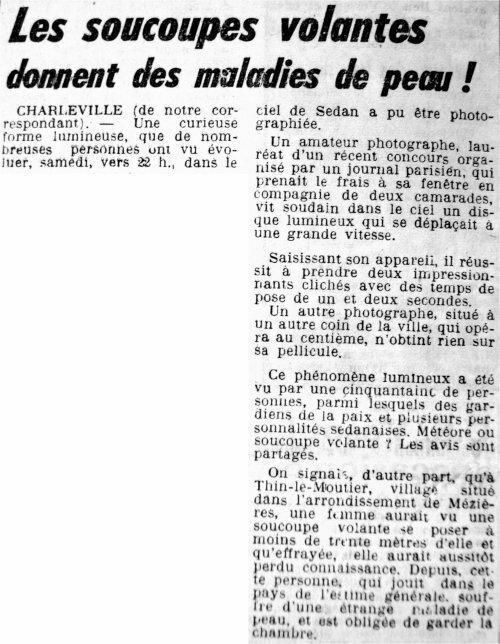 [---] Article in the regional newspaper Le Lorrain, Nancy, France, page 6, October 21, 1954. [jv3] "Les Phénomènes Insolites de l'Espace", book by Jacques Vallée and Janine Vallée, La Table Ronde publishers, France, 1966. [jv3] "Challenge to Science - The UFO Enigma", book by Jacques Vallée and Janine Vallée, Henri Regnery publisher, USA, 1966. [jv2] "Passport to Magonia - On Ufos, Folklore, and Parallel Worlds", book by Jacques Vallée, Contemporary Books publishers, USA, page 231, 1969. [jv2] "Chronique des Apparitions Extra-Terrestres", French translation of "Passport to Magonia", book by Jacques Vallée, Denoël publisher, France, page 278, 1972. [gl1] "Face Aux Extra-Terrestres", book by Charles Garreau and Raymond Lavier, Delarge publisher, J'ai Lu, France, pp 29-30, 1975. [jv3] "Les Phénomènes Insolites de l'Espace", book by Jacques Vallée and Janine Vallée, Robert Laffont publisher, France, page 75, 1978. [fr1] "OVNI - Premier Dossier Complet des Rencontres Rapprochées en France", book by Michel Figuet and Jean-Louis Ruchon, Alain Lefeuvre publisher, France, pp 171-172, 1979. [---] "OVNIS en Ardennes - 10 ans d'enquêtes sur les soucoupes volantes", book by Jean-Michel Ligeron, Jean-Michel Ligeron publisher, 1981. [js1] "Le Dossier 1954 et l'Imposture Rationaliste", book by Jean Sider, Ramuel publisher, France, page 256, 1997. [---] Article in the ufology magazine Lumières Dans la Nuit (LDLN), France, #347, February 1998. [em1] "Examen critique des cas cités dans 'OVNIS en Ardennes' de J-Michel Ligeron", article by Eric Maillot, in "Les Mystères de l'Est", CNEGU publisher, France, #7, page 2/11, 2002. [---] "Computer Catalog of Type 9 Cases", compiled by Brad Sparks. 0.1 Patrick Gross January 26, 2006 First published. 1.0 Patrick Gross December 28, 2009 Conversion from HTML to XHTML Strict. First formal version. Additions [go1], [jb1], [lc1], [ud1], [ud2]. 1.1 Patrick Gross July 2, 2010 Additions [gd1], [gd2]. 1.3 Patrick Gross December 2, 2016 Additions [er1], [ub1]. This page was last updated on December 2, 2016.